CHRISTMAS S HOOKS. This set of 48 sturdy ornament hangers are the perfect addition to heirloom ornaments, DIY ornaments, handmade ornaments, glass ball ornaments or heavy ornaments. The sleek silver snowflake design will go with any traditional or modern xmas decor. SNOWFLAKE HANGERS. 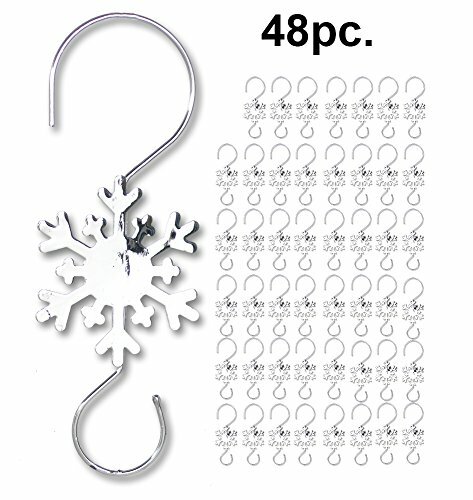 These hooks have a beautiful snowflake design on them which makes them just perfect to use this holiday season. Also great for DIY wreaths, adding accents to garland and hanging decorations from above. DECORATIVE ORNAMENT HANGERS. These are very unique ornament hooks. If you looking for that special addition to your Christmas decorating this, add a few packages to your cart for the ultimate holiday decor. NO BENDING: Unlike other ornament hangers that require tedious bending and manipulation, Banberry Designs Ornament Hangers come properly shaped right out of the box. Simply unpack and start decorating. S-HOOKS. Each hook measure approx 3 1/2" long and the snowflake is approx 1 1/2" diam.